After a rival school pranks the Degrassi volleyball team, Frankie retaliates and is called out for being a racist. 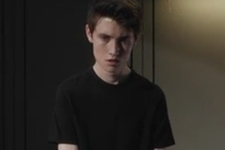 When Hunter purposely crashes his car, Miles realises that Hunter needs help. Maya’s feelings for Zig threaten her co-op placement opportunity. Hunter’s admitted into a psychiatric ward, & realises that if he ever wants to recover, and see Yael again, he must accept professional help. After learning more about racism, Shay considers if she can defend Frankie’s stunt. Angry, Zig blames Maya for everything that happened between them. Frankie organises a diversity mixer to fix things with the Northern Tech team and hold onto her position. Tristan, worried about pressuring Miles and straining their relationship, takes over their robot baby assignment. Yael’s app goes viral, & she has to choose between her integrity & her success. When Zoe doesn’t receive a callback, she worries that it’s because of her homosexual feelings & comes up with a way to hide her true self. When Grace is made fun of her appearance she decides to take on a new look. When Tiny asks Lola to delete her dating profile, she makes a very bold decision. 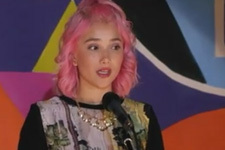 Lola stages a protest for Tiny’s unfair suspension and garners attention during the Degrassi Alumni event. Tristan sets out to alleviate tension in the air by censoring all gala night sketches. Shay is given the opportunity of a lifetime, but must apologize for the protest & compromise her values in order to get it. When Grace begins spending more time with Zig, Maya decides to pursue a friendship with Peter. Frankie tries to escape from her problems by driving off with Jonah, but soon realises that running away isn’t always a solution. A suffering Tiny takes Shay’s advice over Lola’s. When Maya asks Vijay to take down his cover of her song, he responds online, and his fans blow up at her. When a dancing opportunity presents itself to Zig, he’s eager to prove himself and turns to Esme for help. Grace confesses to having feelings for Zig during a party in the woods. To win Volleyball City Finals, Shay realises that they need Frankie, but wonders if she can forgive her. Lola shuts down Shay’s request to date Tiny, which leads Shay to act out during their championship game. Zoe’s burning intensifies & as Winston begins to second-guess their relationship, she finally gives in to her true self.